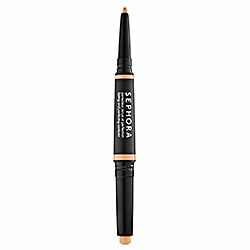 there was a reader request a couple weeks ago for a great concealer. there are several concealers i have used, some being better than others. i decided to do a little research and go on a hunt for a concealer that works, and doesn't break the bank. this little double ended ninja is fantastic. the wide tip end has a Vitamin E infused formula that provides great coverage. give your under eye circles a few swipes and they are concealed and corrected without that cakey look some concealers can give. as a mother of two, concealer has become an essential for me because i love staying up late, and my kids love waking up early. this concealer's easy application makes it a definite Grail, and something i would hate to live without. the thin tipped end is designed for spot concealing, such as zits. the color is a red neutralizing tone and the formulation has salicylic acid to aid your fight against those unruly zits. the thin tip is supposed to be for precision application, but i actually prefer to rub a little on my finger and then apply, i think this makes the spot easier to diffuse, rather than a clear circle of demarcation. the price point for this product is right up my alley. $15 is a small price to pay for a quality concealer. however, if you are interested in a less expensive product, give me a shout and i'll pass on a few suggestions. Thanks for this tip! Would you mind posting all your "Grail" picks for concealers? Happy Thanksgiving!